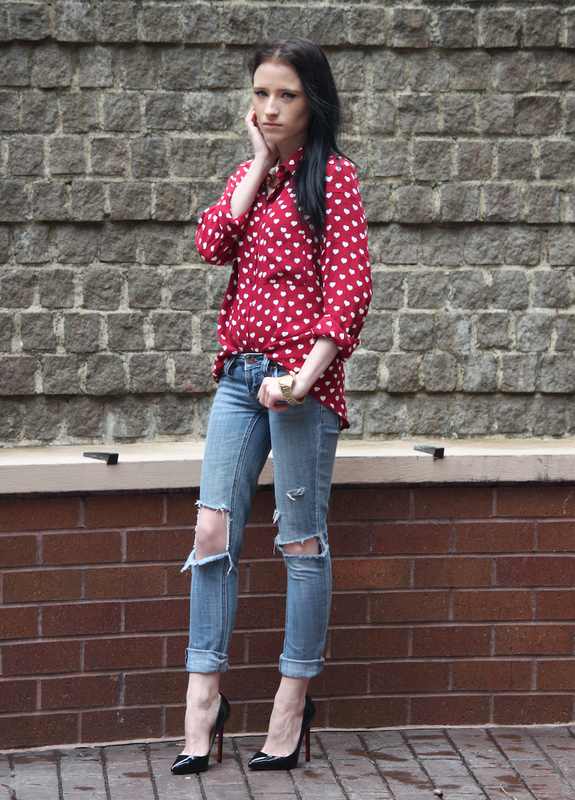 Button Down/Koszula: Topshop, Jeans/Dzinsy: Unknown, Shoes/Buty: Christian Louboutin. Although sometimes I love to mix and match, I also highly favor simplicity. Simple meaning a pair of jeans, a nice casual top, and a pair of heels. This kind of outfit works best when you are in a rush or when you have no idea on what to wear because it is so easy to put together. It is a simple, but clasisc and casual look. You can also add some simple accessories to go. Anything will work as long as everything is matched accordingly. Bardzo lubie laczyc rozne wzory i materialy razem, ale rowniez uwielbiam proste stylizacje. Proste znaczac dzinsy, ladna casual koszule i szpilki. Takie stylizacje sa perfekcyjne na momenty kiedy sie nam spieszy lub kiedy nie mamy pojecia co mamy na siebie zalozyc, poniewaz latwo mozna polaczyc taka stylizacja. Taka stylizacja jest prosta ale casual i klasyczna. Rowniez mozna dodac minimalna bizuterie, ale najwazniejsze jest zeby wszystko pasowalo. I have also created two simple classic and casual outfits for you with Choies products! Check them out! Jeszcze dla was stworzylam dwie klasyczne i casual stylizacje z produktami z Choeis! Mam nadzieje ze sie wam spodobaja! Outfit One: White Mesh Blouse, Pink Pleated Skirt, White Pointed Heeled Sandals Outfit Two: Black Zipper Coat, Black Playsuit, Black High Heeled Sandal Boots. P.S. Can you please click the links under the picture of the two outfits I put together from Choies? It means a lot to me <3 Mozecie prosze kliknac linki pod obrazkiem dwoch stylizacji stworzone przezzemnie? Jest to bardzo wazne dla mnie <3 Dziekuje! Świetna ta koszula i super wygląda w tym zestawie ! Piękne szpilki ! super wyglądają te rozcięcia na spodniach! you top is super cute. This shirt is sooo amazing! all is perfect, you look great, shirt is amazing, I'm following you, you wonna too? The whole look is perfect. Gorgeous shoes!! Chyba nie ma już możliwości obserwowania. omg such a lovely top! Good pairing with ripped jeans! looks great with the denim pants! So pretty, dear! Love so much the jeans! Thanks love <3 No I am not a model! I am an actress! Love the way you tucked the front part of the shirt in, this outfit suits you!